The best rectangle-shaped Christmas stocking filler this year! Celebrating one decade on shelves and in satchels, The Kiwi Diary 2014 is the Tenth Anniversary edition of New Zealand's only eco-responsible year planner. 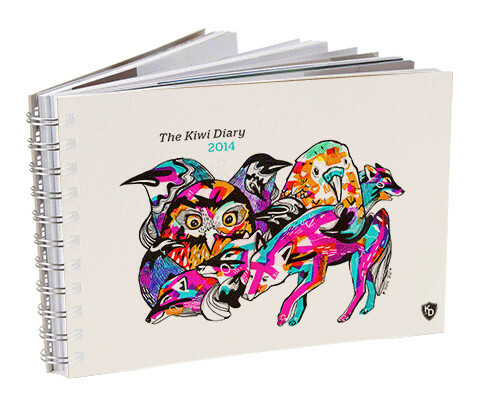 The diary with a difference, the Kiwi Diary contains the fruit that fell when we shook the trees of Kiwi culture, where art, design, recipes and prose from over 80 contributors weaves into a publication which is part cultural almanac, part art gallery, part poetry collection, and part recipe book, with ample space for you to diarise 2014! This is the perfect gift for all who cherish Aotearoa: a unique package of inspiration and innovation, planting fresh in the garden of your mind. Kiwi Diary's 235 pages embody the spirit collaboration, bought together beneath a luscious cover design by Mica Still, set by designer Anna Fawdray. You'll never go hungry for a new idea with a Kiwi Diary in your midst! 2014 contributors include: Mouth watering recipes from chefs including Shaun Clouston - head chef at Logan Brown, Wendy Hillyer of Plentifull Deli, Lauraine Jacobs, Natalia Schamroth of The Engine Room, Tasha Wadeson of Relishes Cafe in Wanaka and delicious adventurous 100% raw creations from soon to be published raw recipe book by Jules Barber; poets David Eggleton, Jan Kelly, Liz Breslin and Annabel Wilson; Designers including David Trubridge and Lucy Gauntlett; writers Ed Willis, Tim Park, James Shaw, Dr Lee Nelson, Dr Renee Liang, Jamie Joseph, Martyn Pepperel and Dr Prudence Stone, and many more emerging talents from around the country to ensure year-round inspiration! Yes it's a cliche, but it's gotta be said, this is the gift that keeps on giving! Every year we give a percentage of profits to a worthy cause. This year that cause is: The One Percent Collective. I am one of the many more emerging talents. Buy it and read my rugby poem, 'becoming men'.